The Fast Forward is a racing A Tail quadcopter with radically tilted and rotated rear motors for maximum forward thrust. The landing gear and motor mounts are the only unusual components. Starting with the front (taller) landing gear, first insert the M2 screw into one leg, and secure it with an M2 nut using loctite (use loctite everywhere but on the locknuts). Follow with a washer. Clean yer nails, hand model. Add a wheel and a washer. Add another leg and M2 nut. Spin the nut on just a few turns, it'll be tightened later. 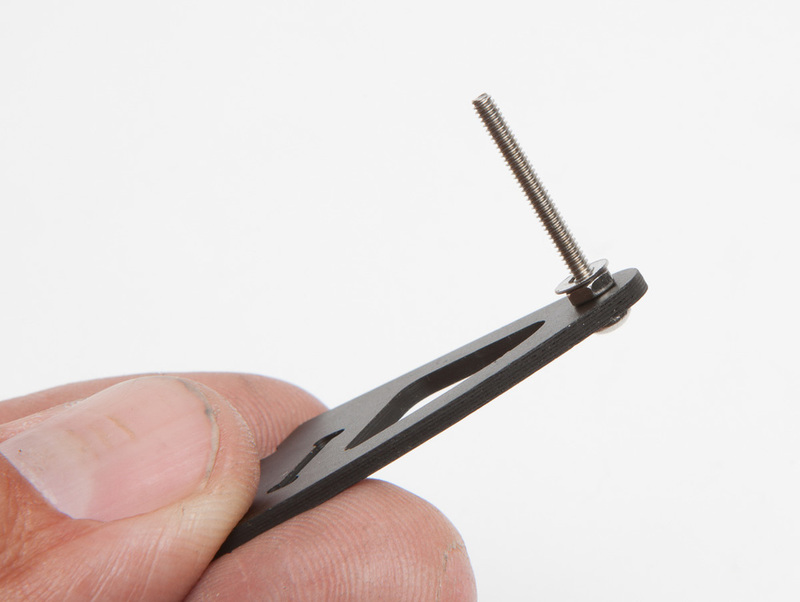 Attach a 7mm standoff to the landing gear retainer with an M3x5mm screw. Insert the tab between the landing gear legs. Slide the assembly onto the front arm and secure with an M3x6 screw. Note that the standoff will not bottom out on the arm, this is so that the parts can be held under tension. Just apply moderate torque to the screw and let the loctite keep it secure. If you keep the M2 screw head to the left then friction from the spinning wheel will keep the inner nut from unscrewing and pinching the wheel. Or you could opt for aesthetics and run both screw heads outboard and let the loctite keep the nut from loosening. Finish by tightening the M2 nut to bow the legs in slightly. Do the same for the rear landing gear, but use an M3x5 screw on top. Begin the motor mount assembly by bolting on your motors with M3x4 screws. Attach a 30mm standoff to one of the stanchions with an M3x6 screw. Drop in the motor mount and motor, attach second stanchion with another M3x6mm screw, but don't tighten it. Drop the assembly onto the rear arm. Insert an M3 nut and use an M3x8 screw to tighten things up from below. Finish by tightening the M3x6 screw on the stanchion. Just like with the landing gear, the standoff will not bottom out against the stanchion. You can mount your ESC's as shown below. Please excuse my ridiculously ghetto builds. All my builds move from frame to frame until they're just a jumble of splices. Or you can pick up a QAV250 pdb from Lumenier, along with some M3x23-5 screws and 10mm spacers/standoffs, and mount your ESC's below. Yes I know that pigtail's a mess. Here's a couple cleaner builds, with Kiss and SN20. Flies great on both. The FF wires up just like an x quad, except in Cleanflight motors 1 and 3 are reversed for an A Tail. Note that Cleanflight has both V and A Tail configurations, make sure to choose the A Tail. You'll note that in my mix the front motors, motors 2 and 4, are at .85 or 85% throttle. This is the setting where it flies neutral with 6x4.5 in front and 5x4 in back with 35 degree mounts. If I wanted more of a kick in the rear I'd drop the front to .75 and the FF will settle into slightly nose down fast flight on its own. My advice is to fly it and note how it settles in forward flight with your hands off the sticks, then tweak the throttle mix 'til it flies how you like. Alternatively, you can also just shift the battery. Unlike an X quad, CG isn't set in stone here. It's the relationship between the centers of gravity and lift that's important. Also note that both rear motors throttle up slightly for roll. Typically only the front motors do the rolling on an A or V Tail, but I like to have both rear motors speed up a bit to keep the nose from lifting on rolls, so they're both at +25%. Here's some starting values for PID's. The most important thing here is that yaw values are lower due to an A Tail's superior yaw response. Those values may drop even more with 50 degree mounts. I'm using HQ 6x3 or 5x4.5 bullnose in front, and 5x4 in back. I've used Lumenier 2206 2000kv's as well as Cobra 2204 1960kv's. I've also used Tiger 1806 2300kv's in back. 4s. The FF's flies kinda like a multirotor, kinda like a plane. If you can fly a quad you can fly the FF, you'll just note some different flight characteristics. Obviously it shoots forward on takeoff and hovers nose up. Roll and yaw aren't perfectly axial so it has a swoop akin to tricopters. It also likes to turn like a plane with its nose forward rather than in. If you dial in the motor mix just right it'll accelerate forward with just throttle, no need to push the nose down, especially with the 50 degree mounts. It'll feel very familiar yet different and fun. I strongly recommend starting with the 35 degree mounts before moving on to the 50's. With the 50's it's a bat outta hell that's great for racing but not terribly relaxing to fly. But then again I'm not the world's greatest pilot either. This is one of the harder things to do with the FF, especially with 50 degree mounts. For rolling landings, take note of the horizon position before takeoff – that's the attitude you want to approach at. The front landing gear is slightly taller to give it a nose up attitude for slower landings. Once down you can taxi her back to yourself, the back end gets light enough you can steer it on the ground even though the rear wheel doesn't pivot. I use a little back elevator to keep her from nosing over, and I use a tiny bit of aileron when turning. Here's a successful landing with the 50 degree mounts. You can do everything right and a bump can still tip you over, so nailing one just right is extra special. And of course, no walk of shame! For vertical landings you'll want to cut throttle as soon as the rear wheel touches. If you don't the FF will level out and shoot forward. Vertical landings with the 50 degree mounts can be difficult. It hovers so nose up with the 50's that it's hard to get a feel for where the ground is. The best thing is to get a nice low sideways flare and cut throttle over high grass. The better you have her tuned the easier she'll be to land.